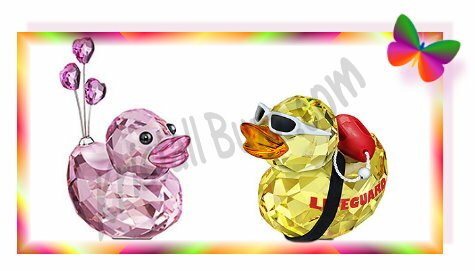 Swarovski produces and markets a group of crystal duck figurines in the Crystal Moments product line. This group is called the Swarovski Happy Ducks. Presently, there are just over 15 Happy Ducks in the Swarovski crystal badelynge. Two of my favorites are Swarovski Sunny Steve and Swarovski Sunny Sam. These Happy Ducks love the sun and ocean, and are enjoying their party on the beach. Swarovski Sunny Sam was a limited edition. The crystal brand did a one-time production run to manufacture their supply. It was released in 2010, and as of July, 2011, it no longer appears on the Swarovski web site. Sunny Sam’s accessories include silver ‘shades’ and a red-and-white life preserver. The designer for Sunny Sam is Verena Castelein. The Swarovski crystal identification numbers for Sunny Sam are 9400 000 262 / 1041295. Swarovski Sunny Steve is a new release in 2011. It is not presently advertised with any wording of limitations, so I assume it is a normal product release. Sunny Steve’s accessories include a faux shark-tooth necklace, black ‘shades’, and a surfboard decorated with pastel flowers. The surfboard includes the catchy phrase: ‘Be faster than the shark’. The designer for Sunny Steve is Verena Castelein. The Swarovski crystal identification numbers for Sunny Steve are 9400 000 347 / 1096743. Both Sunny Steve and Sunny Sam retail(ed) for $120 USD. They are both yellow (officially light topaz) in color. Both Happy Ducks are approximately 2.25″ in length. Sunny Sophie for Sunny Steve. Sunny Sophie should have a beach umbrella to avoid sunburn. Sunny Sirena for Sunny Sam. Sunny Sirena should have a beach ball for more ‘fun in the sun’. 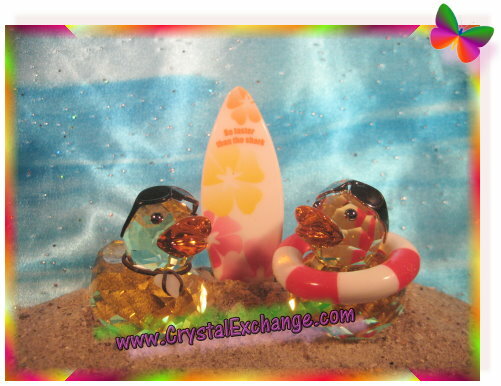 Stay cool this summer like these Swarovski Happy Ducks….I’m melting here in southwest Ohio….something like 12 consecutive days of 90 degrees Fahrenheight with a heat index over 100 degrees every day. Check out the official Swarovski brand web site if you are looking to add Swarovski Sunny Steve to your crystal collection. Check out the Crystal Exchange America web site in the ‘Limited Edition Swarovski’ category to find the Sunny Sam figurines available for purchase.